Impatiens are one of the easiest flowers to grow, only coming in second to Petunias. They are often referred to as “Touch Me Nots” because when you touch the seed pods they explode spreading seeds in every direction. There are approximately 1,000 different species of Impatiens. But, there are only two varieties that are widely available, Impatiens balsamina and Impatiens walleriana. Impatiens can be planted in almost any area in the garden which makes them a very popular flower. Depending on the variety you choose, Impatiens can thrive in either sun or shade. They are an excellent choice for hanging baskets. And, are often used as an edging around porches, decks, sidewalks and trees. While they are easy to care for, they do still need some basic care. There are several different varieties available that grow from 8 inches in height up to two feet tall. They come in a wide selection of colors including pink, red, white, orange and violet. They are also available in a combination of two colors, such as pink and white. Impatiens are classified into three types, solo, partially doubled and doubled. Some varieties have flowers that are flat, while others very closely resemble roses. One of the most important factors in growing beautiful lush Impatiens is water. Too much water and too little water are both deadly to the plant. The key is to keep the soil moist without allowing the plants roots to stand in water. These flowers have soft stems which will wilt very quickly if they don’t get enough water. However, make sure the soil has good drainage to keep the roots from rotting and black fungus from developing. If you plant your Impatiens in the shade, they will require less water than if they are in the sun. Because they do wilt quickly, your plant can literally tell you that it’s not getting enough water. In hot, humid conditions, they may need a moderate amount of water on a daily basis. If the plants are used as an edging for larger plants they will need more water and fertilizer to compensate for what is absorbed by the larger plants. Impatiens can easily be grown in pots or hanging baskets, but they will need a little more attention. The soil in baskets and pots dries out rapidly especially on hot days. You can test the soil by inserting your finger into the dirt about 2 inches. Water only when the soil is dry at that depth. To be safe, you should check your basket or pot every other day until you get a good idea of how quickly the soil is drying out. Standard potting soil isn’t a good choice for Impatiens. It’s generally very dense and won’t allow for good drainage. Choose a potting soil that is classified as a “Pro Mix” or “Nursery Mix”. These types of potting soils are light and airy and will provide better drainage. They are also disease free and can keep your flowers healthier. Like any other plant, Impatiens need fertilizer to grow strong and lush. A high quality general purpose plant food will work fine. If your plants are in the yard, fertilize them about once each month. But, if they are in hanging baskets or pots, they will require a good fertilizer every two weeks. You can also use plant food spikes to supply fertilizer every time you water. Although Impatiens can grow in partial shade, full shade, or in the sun, full sun for 8 hours can quickly kill these tender plants. A few hours of sun each day is much better than all day sun. If you do want to plant them in an area with full sun, they will need to be allowed to adapt gradually. You can easily do this by exposing them to longer periods of direct sun over the period of a week. You can easily grow Impatiens from seed. You can start the seeds a few weeks before the last frost and then transplant the young seedlings outdoors, or into a container. Lightly cover the seeds with a thin layer of dirt, keep them moist and warm. You can also propagate Impatiens from stem cuttings. The cuttings need to be around 3 to 4 inches long and should be potted in moist sand or peat moss until roots form. To prevent diseases and fungus never allow the soil to be soaked for any length of time. Providing proper drainage is the best form of prevention for plant problems. Always remove any dead blooms, leaves or stems which will rot and increase the chances of diseases and fungus. Impatiens are tender plants that are very susceptible to frost. So, if you want to keep them longer, make sure you bring them indoors before it frosts. To properly plant Impatiens dig a hole that is approximately the same size as the root ball. You want the plant to sit in the ground, or pot at the same level it was at in the pot you purchased it in. You can place the plants as close or far apart as you’d like. 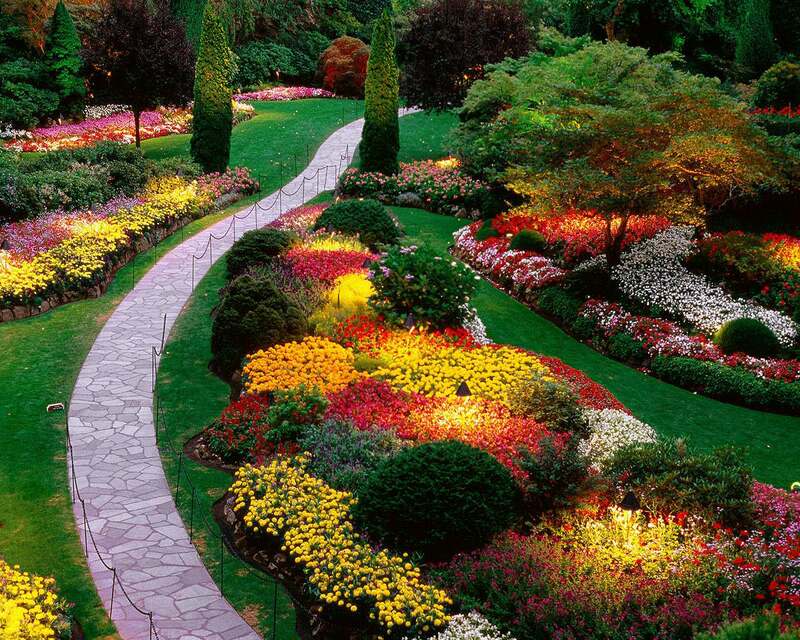 However, if you plant them close together they will quickly create a beautiful border. All my impatiens are tall and leggy how do I get to look full and bushy? My uncles plant is really nice full and bushy he said to pinch the leaves back but im not having any luck. Can you please help?